Southern Racing Suspension specialise in Motocross (MX) and Enduro race tuning and bike suspension services to give you the competitive edge on the track. Whether you’re 60kg or 100kg, riding sand tracks or hard pack, the setup and tuning of your motorcyle is paramount to getting the most out of your bike and the riding experience. 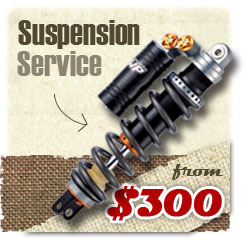 By getting your suspension service and bike set up and tuned by the professionals at Southern Racing Suspension, you can be sure that you’re giving yourself every possible advantage to perform to the best of your ability, whether that be racing motocross, racing enduro or just casual riding. This service is our specialty. If your weight is outside 70-80kg, it is likely that your suspension won’t be working properly. Let us help to make it perfect for you! 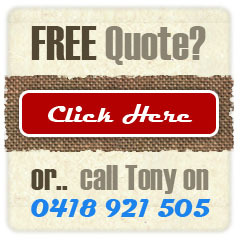 Most manufacturers advise servicing suspension between 20-30 hours! A pro rider can boil the oil in one days riding, which means reduced dampening effect! 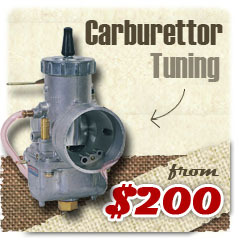 We regularly attend to carburetor issues and have the know-how to fix them. Save money by removing the rear shock from your bike before you bring it in. Your suspension is only as good as your rubber, we can fit the correct tyre compound for your riding conditions. This is important if you run out of clickers, or would like to match your new springs and valving to work together. When we remove the forks from you ride we generally find buggered steering bearings, this is a common result from pressure cleaning. We replace bearings and triple clamps to correct angles for the individual making the bike steer like its on rails. Linkages, like the steering, can become corroded from the rigours or racing and cleaning your bike. We can press in new bearings with special grease to repel water and the suspension works like new again!